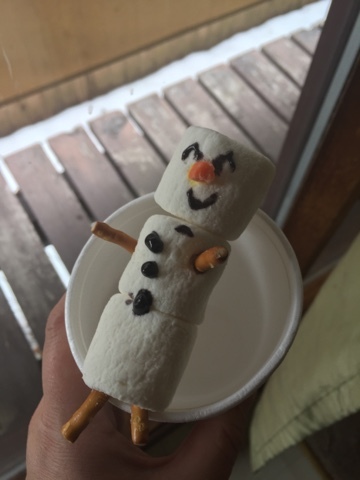 Though neither my husband or myself are much into celebrating secular holidays, we do try to put a bit more effort in a few for the children's sake. I used to go all out as far as decorating goes, but after a few mishaps with the littles and the cats, I decided I'd put off decorating a full tree for a few years. This winter has been rather mild, so Didi has been enjoying spending some time playing outside. I'd love to say that I take the kids out in the snow, but alas, I wasn't made for it. Frankly, I'm more of a toes in the sand kinda gal. But, thank goodness Daddy loves it as much as they do, so they get to play all the reindeer games they want. Oh our pretty pretty girl. I can't believe how fast the years have gone. It feels like it was just yesterday when she was doing the can-can in my belly. 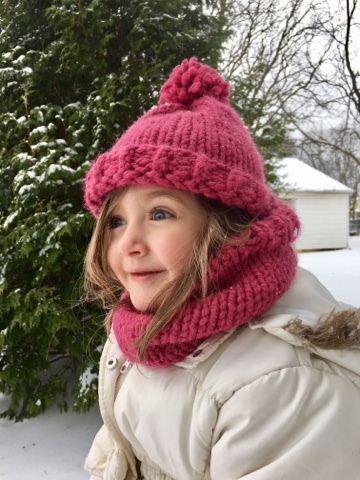 She started school this September, and oh my goodness, have we EVER been sick! I swear, she's brought home every single germ she's come in contact with! It's maddening, it feels like we just can't get better, but the two week break certainly did give us some reprieve. 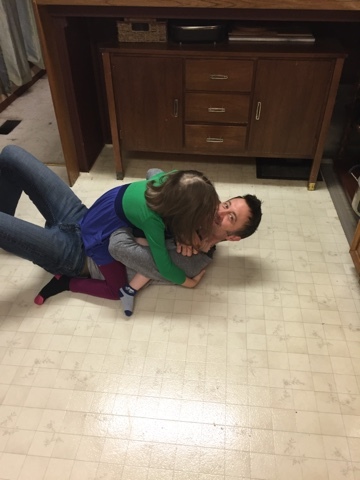 Her classroom had a little party on the last day of school, and our family (ahem: Me!) was responsible for making a fruit platter for them. 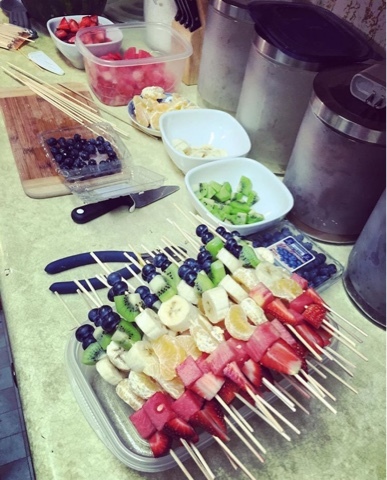 I decided to go for some Fruit Kabobs, to make it easier for the teachers to dole them out, and keep the room clean. They were very easy to put together, merely requiring a little more preparation the night before (just cut up the fruit and spray them with lemon water to avoid oxidizing), then assemble, and snip off the sharp end before sending them off, to prevent any of the smalls from hurting stabbing themselves (or let's be honest, each other! Ha! Ha!) with them. 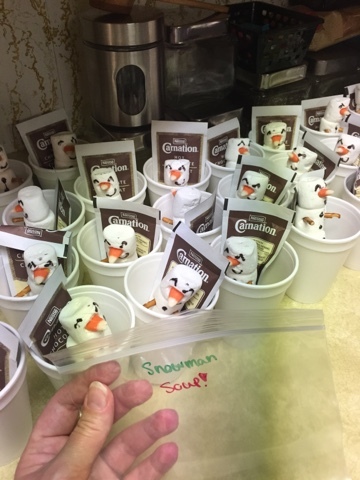 I decided to add a sweet treat for each child, and the teachers, by making some snowman soup packets. I enrolled our Mimi for this one, who enjoyed using her artistic skills to draw the faces on these bad boys with some black icing, then helping me assemble them. As luck would have it, our local Bulk Barn keeps seasonal (Halloween) coloured Candy Corn in stock off season, so I was able to buy a fresh back to create these guys' "carrot" noses. 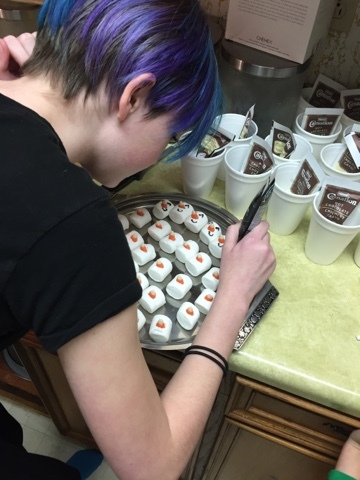 I received a text from the teacher the day of, claiming that the treats were a hit with the kids! So as I mentioned, we don't put a Yule tree up, and I really do miss it, but I did find a reasonable facsimile, at IKEA of all places (really, why am I surprised? ), it was my Mom who found it actually. It's a large fabric panel (size of a large curtain, really), printed with the image of a perfect evergreen. I can't really decorate it, unless I wanted to poke holes in it with the ornament wires, but I do let the kids have fun by adorning it with seasonal stickers. 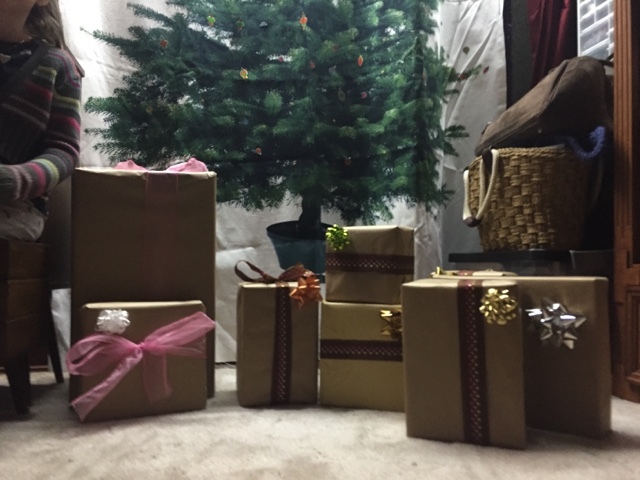 It's funny not having a tree to put the gifts under, but it works for us. For now. 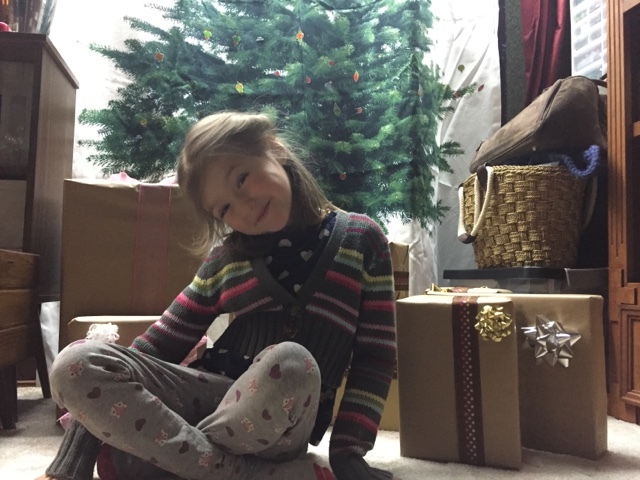 The kids certainly don't seem affect by it ;) This little darling had been asking for a teddy bear for months, so imagine her surprise when she found out that the biggest box on display was for her. I'll never forget her squeeeee when out popped a huge bear, almost exactly her size! 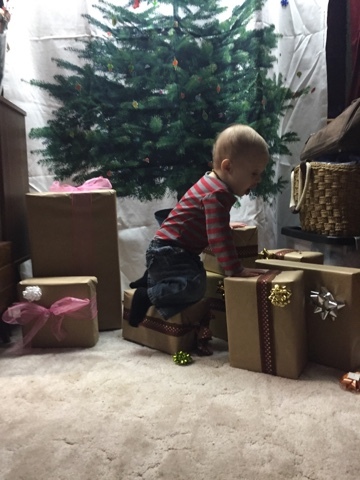 Ryker sure loved the pretty present wrappings too, as you can see, the bows didn't stand a chance with this little guy around. But his absolute favourite, was rolling around in the big pile of crumpled paper, ribbons and bows after everyone was done tearing through them. It was the cutest thing. 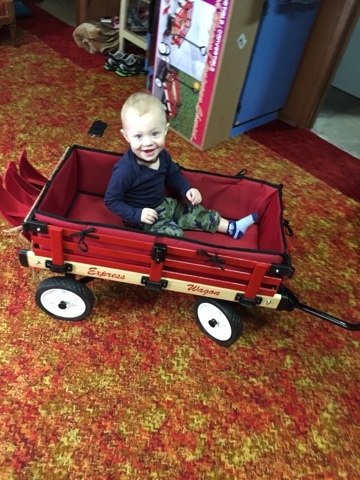 Oh and this was, by far, Ryker's absolute favourite present: A little red wagon from Nana Jo and her hubby Denis. It'll be so fun to pile the kiddos in and take them on quick rides. The wagon came with the regular plastic wheels, but also, some sleigh skis for traveling through snow. Those will be nice to have on those very snowy days, but I was happy to see that the company also carries extra accessories for this, like an awning, and a plastic cover, to protect them from the sun and elements. Oh, and a set of large pneumatic tires, which we'll be ordering, because we think those will definitely make the ride smoother.